Shark 281 NC 5.0, electrohydraulic automatic band sawing machine which can operate also in semi-automatic, semi-automatic/dynamic and manual mode to cut from 0° to 60° left. CNC machine with a new controller : MEP 50 with Windows “CE” based. This new PLC has been specifically designed by MEP for the automation of its range of products. A FEW FEATURES: 7” touch screen display operator interface and push buttons for all functions of the sawing machine. SHARK 282 NC 5.0, electro-hydraulic automatic band saws sawing machine which can operate also in semi-automatic, semi-automatic/dynamic and manual mode. Automatic cycle cut from 0° to 60° left. Semi-automatic, semi-automatic/dynamic and manual cycle (for cuts from 45° right to 60° left). CNC machine with a new controller : MEP 50 with Windows “CE” based. This new PLC has been specifically designed by MEP for the automation of its range of products. SHARK 330 NC 5.0, electrohydraulic automatic band saws sawing machine which can operate also in semi-automatic cycle to cut at 0° with restpiece which cannot be fed in automatic of 85 mm. CNC machine with a new controller : MEP 50 with Windows “CE” based. This new PLC has been specifically designed by MEP for the automation of its range of products. A FEW FEATURES: 7” touch screen display operator interface and push buttons for all functions of the sawing machine. It is simple and intuitive , it guarantees a reliable use and it controls all cutting parameters in real time. SHARK 331 NC 5.0 spider, Electrohydraulic automatic band saws sawing machine which can also operate in semi-automatic cycle for cuts from 0° up to 60° left. Machine with compact dimensions. 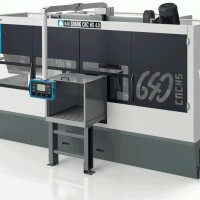 CNC machine with a new controller: MEP 50 with Windows “CE” based. This new PLC has been specifically designed by MEP for the automation of its range of products. SHARK 332 NC 5.0, electrohydraulic band saws sawing machine with multimicroprocessor which can operate in automatic, semi-automatic, semi-automatic/dynamic and manual mode. Automatic cycle (to cut from 0° to 60° left). Semi-automatic, semi-automatic/dynamic and manual cycle (for cuts from 45° right to 60° left). CNC machine with a new controller : MEP 50 with Windows “CE” based. This new PLC has been specifically designed by MEP for the automation of its range of products. SHARK 230 NC HS 5.0, electrohydraulic automatic double-column bandsaw for 0° cuts on profiles and solid parts in structural, stainless and alloy steels, with restpiece which cannot be fed in automatic of 60 mm. It cuts dimensions up to 230×230 mm and can operate also in semi-automatic cycle. CNC machine with controlled double axis so as to obtain, on the same bar, 1000 different lots each of different lengths and quantities.CNC machine with a new controller : MEP 50 with Windows “CE” based. Shark 310 CNC HS 4.0, automatic double-column bandsaw for 0° cuts on structural, stainless and alloy steels, profiles and solid parts, with dimensions up to 310×310 mm. CNC machine with a new controller: MEP 40. It has been specifically designed by MEP for the automation of its range of products. This sawing machine also features a semiautomatic cutting cycle and uses latest generation technologies; indeed, Shark 310 CNC HS 4.0 is equipped with a NEW controller with processor RISC 32 bit 200 MHz with integrated interface. Shark 420 CNC HS 4.0, automatic double-column bandsaw for 0° cuts on structural, stainless and alloy steels, profiles and solid parts, with dimensions up to 420×420 mm. CNC machine with a new controller: MEP 40. It has been specifically designed by MEP for the automation of its range of products. 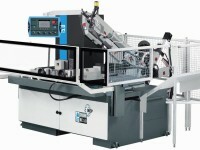 This sawing machine also features a semiautomatic cutting cycle and uses latest generation technologies. Shark 640 CNC HS 4.0, automatic double-column bandsaw for 0° cuts on structural, stainless, alloy steels, profiles ,solid parts and profiles with dimensions up to 640x640mm. CNC machine with a new controller: MEP 40. It has been specifically designed by MEP for the automation of its range of products. This sawing machine also features a semiautomatic cutting cycle and uses latest generation technologies; indeed, Shark 640 CNC HS 4.0 is equipped with a NEW controller with processor RISC 32 bit 200 MHz with integrated interface.